BAKERSFIELD, Calif. - March 10, 2007 - NHRA POWERade Drag Racing Series driver Ron Capps took advantage of an off-week for that series to join the Nostalgia Funny Car "Five-Second Club" during qualifying for Sunday's eliminations at the 49th anniversary of the Bakersfield March Meet at Auto Club Famoso Raceway. 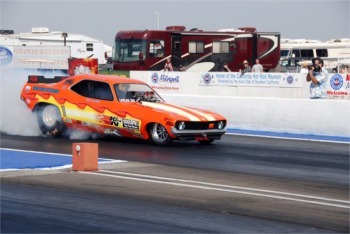 Capps, who resides in Carlsbad, Calif., took his 1970 Barracuda down the quarter mile in 5.987 seconds at a speed of 236.09 miles per hour, becoming the fast qualifier in Nostalgia Funny Car over Stephen Romanazzi of nearby Visalia in a 1979 Chevrolet Vega at 6.086 seconds and 233.58 mph. In the hotly-contested Top Fuel class, sixteen cars made up the final qualifying field of front-engined machinery. Brad Thompson of Visalia was the top qualifier at 5.746 seconds and 247.11 miles per hour over Rick White of San Diego at 5.822 seconds and 250.69 miles per hour. Top speed of the meet so far belonged to seventh-fast qualifier Brett Harris of Kaysville, Utah at 256.04 mph, but his time of 5.911 seconds barely kept him in the top half of the field. Action continued with final eliminations on Sunday. Gates opened at 7 a.m. Pacific Daylight Time with racing starting at 8 a.m.